Animal Shelters Have Their Day! 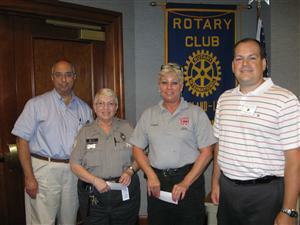 Representatives from the Cumberland and Lincoln Animal Shelters attend Rotary meeting to accept Pet Walk 2010 donation. Sandy Philips from the Cumberland Animal Shelter, LuAnn Noreau from the Lincoln Animal Shelter and Marie Gorman from Lincoln Friends of Animals were in attendance at the Cumberland Lincoln Rotary meeting on July 19th to accept a donation. For each of the past seven years the Cumberland Lincoln Rotary Club has sponsored a Pet Walk to raise money for the animal shelters from each town as well as other Rotary charities. Thanks to a lot of hard work and some generous sponsors and dog-walkers, the club was able to donate $1,500 to each of the shelters. Sandy and LuAnn were kind enough to spend a few minutes each updating the club on recent ongoings within the shelters and how the money might be spent to benefit the animals. Planning has already begun on next year's Pet Walk, which we hope will be bigger and even more successful than past events!